The 9% VAT Rate is essential for continued growth in the tourism and hospitably sectors across rural Ireland. That’s the message from the Irish Hotels Federation, and its a message that Cork Seantor Tim Lombard (Fine Gael) agrees with. 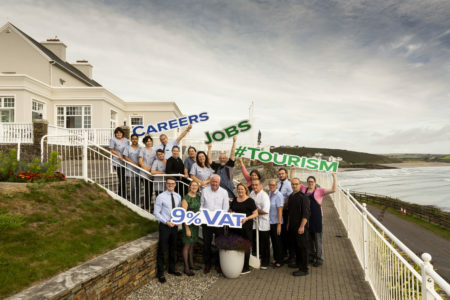 Related photograph: Hotels and guesthouses across Cork are backing a call by the Irish Hotels Federation (IHF) for the Government to retain the tourism VAT rate at 9%, saying it is essential to help further job creation and tourism growth. Tourism supports some 25,300 jobs throughout the county and contributes euro 855 million each year to the local economy, making an enormous contribution to Cork. Pictured with employees at the Dunmore House Hotel, Cork are the staff of Dunmore House Hotel. Pic. Emma Jervis PhotographySenator Lombard said: “The 9% VAT rate continues to be a most important tool in enabling the sector, especially in rural areas, to maintain value for money for our visitors. We must not forget how vital it continues to be in sustaining the continued growth of our tourism sector. “We have witnessed a slight decline in UK visitors due to the weakness of Sterling. Maintaining the 9% VAT rate will see us continue to be a competitively priced option for holidaymakers. “Given all of the uncertainty around Brexit it would be imprudent to risk damaging the hospitality and tourism sector by making it less attractive for visitors. Many of our regional areas are still a long way from achieving sustainability and are totally reliant on seasonal business. “This rate was introduced by the Taoiseach Leo Varadkar when he was the Minister for Transport, Tourism and Sport. It was an exceptional boost to jobs growth, providing more taxation funding for the Exchequer,” Senator Lombard said.